Taking their name from the Gaelic word for kinship, Gaelic super group Dàimh return for their fourth appearance at the Towne Crier. 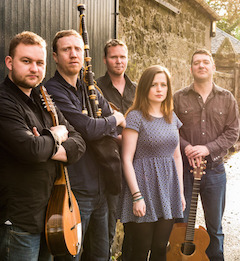 Dàimh fuses together music from across the Celtic diaspora in a celebration of their common ground. From pyrotechnic jigs and reels to achingly poignant ballads, they run the full expressive gamut of folk music at its best, and are justly renowned for their thrilling live shows. Dàimh (pronounced "dive") are based in Lochaber in the Highlands and Islands of Scotland; an area as much renowned for its scenic beauty as for its rich musical and cultural heritage. A long‐established favorite at folk festivals in Scotland, Ireland and across Europe, twice nominated for Folk Band of the Year at the Scots Traditional Music Awards, Dàimh are also regulars on BBC television.